So, quite a few games these days have character creators, and some of them are insanely deep and customizable. Post your favorite created characters here, and let us know if you came up with a backstory or motivation, or any quirks you're RPing with or anything else! I'll start it off with my Monster Hunter World character, Chozen Hunter. He and his Palico, Sakura (Named for the delicate cherry-blossom pink spot over it's eye) have been together for a while. They've traveled far and wide and gotten into a bunch of bar room and back alley brawls they barely made it out of. Chozen is a bit of a pretty boy and has a somewhat fragile ego about his looks, but it's mostly a deflection. He's deeply ashamed about his past and hopes that no one finds out that he comes from a wealthy family. He's sure that they won't take him seriously and that his hard earned skills and trophies would be discounted as "just a rich kid with a hobby" or "paid for with daddy's money". In reality, he's been running away from his family for years now, and wants nothing to do with their wealth. He wishes that they'd leave him be, but he's the heir to a gigantic fortune and so he's always been trailed by an army of lawyers and detectives trying to bring him home and make him assume the burden of the family name. He fled to the New World and became a Monster Hunter to see if maybe, this time, he's run far enough away that they won't find him. I just came across my old BB Hunter, Abraham Temple. He's a Eurasian Gentleman of means, in his mid 50's. About 10 years ago, he was diagnosed with the early signs of distemper, he's expunged much of his once vast wealth to travel the world and divine a cure for himself. He's tried all manner of cure-alls, dabbled in any promising ventures in both the sciences and the arcane.... but it's getting worse. Finally he hears a rumor and chases it to it's conclusion. Drawn to the streets of Yarnham by tales of the old blood, he's hoping that it finally has what he's been seeking for so long. 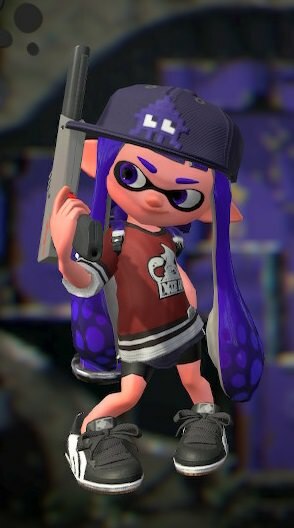 This is my squid in Splatoon 2, if that counts. @ikataishou I think it turned out pretty good, at least from this static angle. Oblivion and Dark Souls (3) might be one of the worsts. That is not only because of the graphical “style” e.g. terrible head morphs but also simply usability. DS 3 is for a current gen game really bad. The characters actually can’t speak because the mouth isn’t even completely modelled and I am not so sure if the eyes aren’t also just some textures on the face, instead of modelled eyeballs. And when I think about how you applied color to the face, it feels more like a (bad) developer tool then anything user-friendly. Anyway, I love character creation and can spend hours on it in an extensively modded Skyrim or Sims 4. Before I delete Skyrim again to free up some space on my hdd I´ll try to shoot some nice pics and share.